The wealth gap between America’s high income group and everyone else has reached record high levels since the economic recovery from the Great Recession of 2007-09, with a clear trajectory of increasing wealth for the upper-income families and no wealth growth for the middle- and lower-income families. Wealth is the difference between the value of a family’s assets (such as financial assets as well as home, car and businesses) and debts. It is an important dimension of household well-being because it’s a measure of a family’s “nest egg” and can be used to sustain consumption during emergencies (for example, job layoffs) as well as provide income during retirement. Wealth is different from household income, which measures the annual inflow of wages, interests, profits and other sources of earnings. The data have also shown a growing gap in wealth along racial and ethnic lines since the recession ended. In our analysis, we categorized families by their household income, after we adjusted their incomes for family size. Middle-income families are families whose size-adjusted income is between two-thirds and twice the median size-adjusted income. Lower-income families have a size-adjusted household income less than two-thirds the median and upper-income families more than twice the median. This methodology results in 46% of America’s families being classified as middle income in 2013. One-third of families were lower income and 21% were upper income. For a family of three in 2013, a household income of $38,100 qualifies as middle income and $114,300 or greater qualifies as upper income. The tabulations from the Fed’s data indicate that the upper-income families have begun to regain some of the wealth they lost during the Great Recession, while middle-income families haven’t seen any gains. The median wealth among upper-income families increased from $595,300 in 2010 to $639,400 in 2013 (all dollar amounts in 2013 dollars). The typical wealth of middle-income families was basically unchanged in 2013 — it remained at about $96,500 over the same period. As a result, the estimated wealth gap between upper-income and middle-income families has increased during the recovery. In 2010, the median wealth of upper-income families was 6.2 times the median wealth of middle-income families. By 2013, that wealth ratio grew to 6.6. 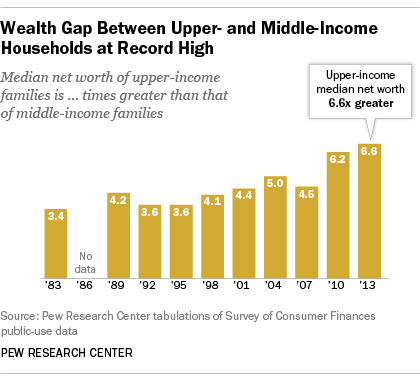 To be sure, the wealth gap between upper-income and middle-income families also widened during the Great Recession. The median wealth of all three income groups declined from 2007 to 2010. 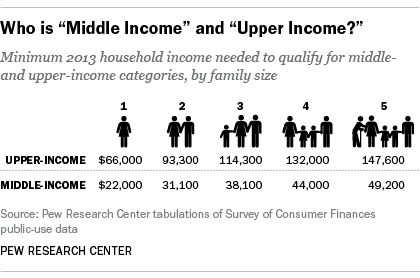 But upper-income families were not hit nearly as hard as lower- and middle-income families. Median wealth declined by 17% from 2007 ($718,000) to 2010 ($595,300) among upper-income families. In contrast, middle-income (-39%) and lower-income (-41%) families had larger declines in wealth. The larger losses among middle-income families resulted in the wealth gap between upper- and middle-income families rising from 2007 (4.5) to 2010 (6.2). The latest data reinforce the larger story of America’s middle class household wealth stagnation over the past three decades. The Great Recession destroyed a significant amount of middle-income and lower-income families’ wealth, and the economic “recovery” has yet to be felt for them. Without any palpable increase in their wealth since 2010, middle- and lower-income families’ wealth levels in 2013 are comparable to where they were in the early 1990s. It could help explain why, by other measures, the majority of Americans are not feeling the impact of the economic recovery, despite an improvement in the unemployment rate, stock market and housing prices. In October, just one-in-five Americans rated the country’s economic conditions as “excellent” or “good,” an improvement from the 8% who said that four years ago, but far from a cheery assessment. And a new poll released this week found higher-income adults are hearing about better economic news than lower-income adults, with 15 percentage point difference between the two groups on the “good news” they’re hearing about the job situation, for example. While most American families remain financially stuck, upper-income families have seen their median wealth double from $318,100 in 1983 to $639,400 in 2013. The typical wealth level of these families increased each decade over the past 30 years. The Great Recession did set back the median wealth of upper-income families, but over the past three years these families have recouped some of their losses.